At our house, we are big on breakfast for dinner. Breakfast for breakfast, on the other hand, is a different story. When I see others’ meal plans that include plans for breakfasts, lunches, AND dinners, my eyes kind of glaze over. We’re kind of a “fend for your self” family when it comes to breakfasts (well, except for my 2-year-old, whose breakfast of choice would be three sips of diet soda, fruit snacks, and a pacifier), and, to a lesser extent, lunches (because if I left my bigger kids in charge of lunch, they’d probably eat Ramen, hot dogs, and cheese sticks, possibly all at once.) I’ll do dinners. I can throw ’em a bone. I’ll throw all my waffle-making, egg-scrambling, burrito-making resources into dinner. I’ve been making variations of this recipe for a long time, and I’m not even sure where the original came from–it’s one of those hand-scrawled copied recipes from a friend of a friend of a friend. Over the years, I’ve added chorizo sausage and crispy hash browns, rearranging ingredients here and there. You know. Just the way things go when you can’t leave a perfectly good thing alone. stirring frequently, until cooked through. Using a slotted spoon, remove from the pan and drain on a paper towel, reserving the drippings. When drained, add to a medium mixing bowl. 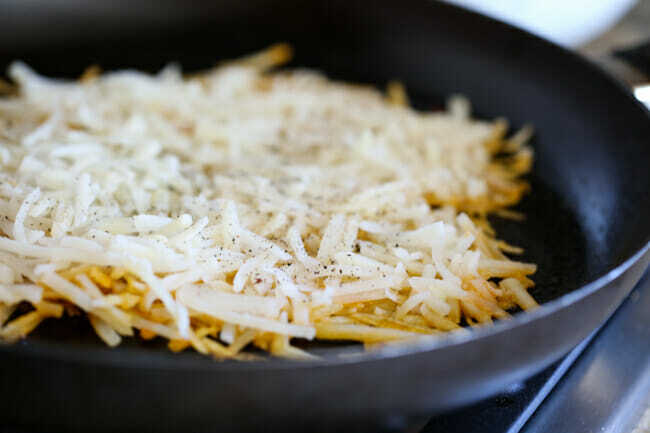 In the same pan (and the same drippings), add 2 cups of shredded hash browns in a thin layer. Sprinkle with salt and pepper and cook for about 7 minutes or until brown and crispy, then flip and cook until the other side is brown and crispy. Remove from pan and add to the cooked sausage. Return the pan to heat and melt the tablespoon of butter. Add 8 whisked eggs and scramble (if you want some tips scrambling eggs, check out this post.) When done, add to the eggs and potatoes and stir to combine. and green onions. Measure out 1 cup of the sauce and mix it with the egg mixture. and roll securely. Place in a 9×13″ pan. Pour the remaining sauce over the enchiladas and sprinkle with cheese (1/2 cheddar, 1/2 pepper jack). 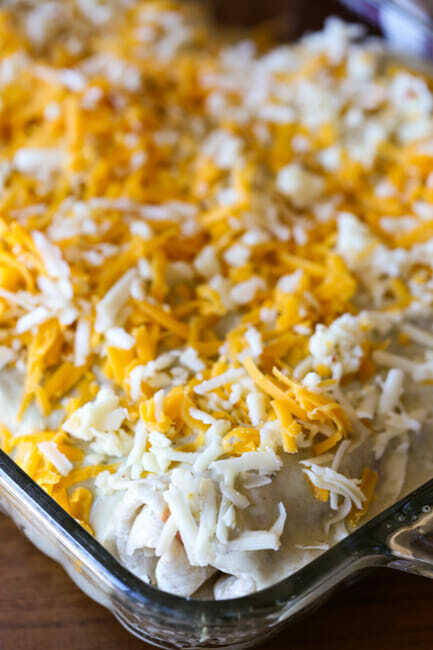 Bake for about 30-35 minutes or until the cheese is melted and the sauce is bubbly. Remove from oven and allow to stand for about 5-10 minutes before serving. Makes 8 servings. This is one of those recipes from a friend-of-a-friend-of-a-friend kind of thing, that was scrawled by hand who knows how many years ago. And can we all just agree that those are the best recipes? 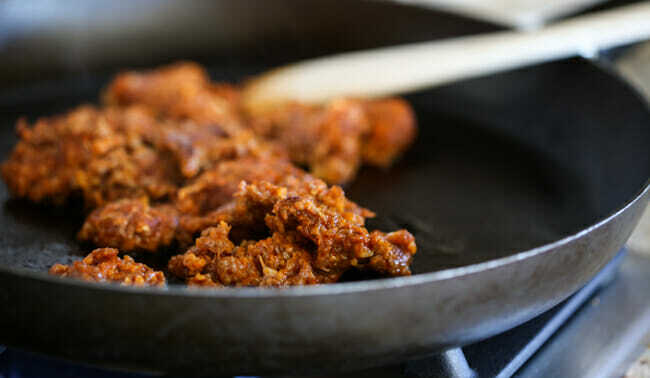 Over medium heat in a large skillet, crumble the chorizo and cook, stirring frequently, until cooked through. Using a slotted spoon, remove from the pan and drain on a paper towel, reserving the drippings. When drained, add to a medium mixing bowl. In the same pan (and the same drippings), add the hash browns in a thin layer. Sprinkle with salt and pepper and cook for about 7 minutes or until brown and crispy, then flip and cook until the other side is brown and crispy. Remove from pan and add to the cooked sausage. 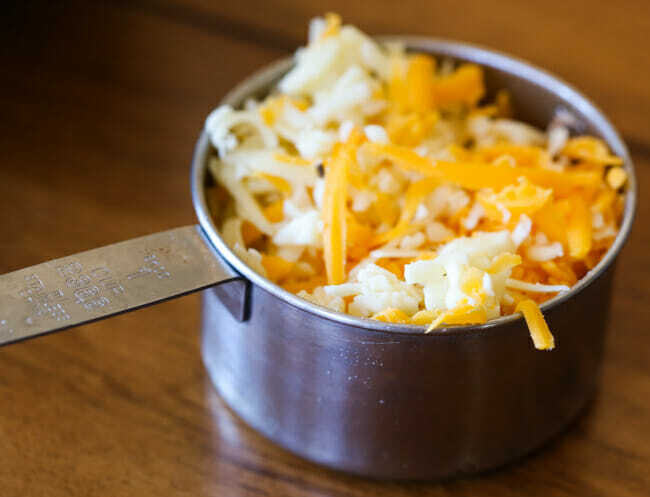 Return the pan to heat and melt the tablespoon of butter. Add the whisked eggs and scramble. When done, add to the eggs and potatoes and stir to combine. In a small-ish mixing bowl, whisk together the cream of mushroom soup, sour cream, enchilada sauce, chilies, and green onions. Measure out 1 cup of the sauce and mix it with the egg mixture. 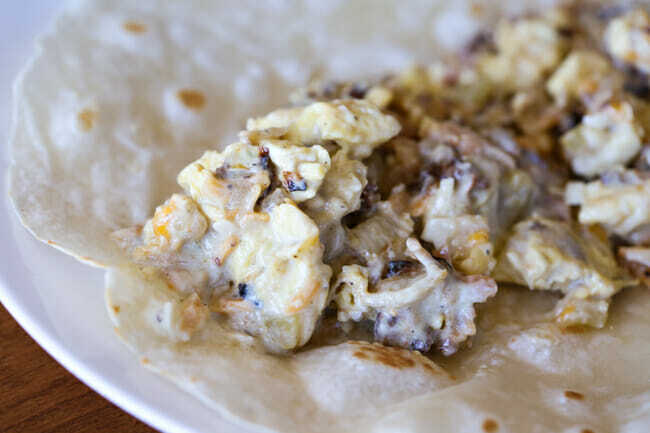 Fill each tortilla with about 1 cup of the egg mixture and roll it securely. Place in a 9×13″ pan. 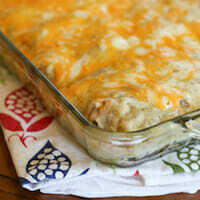 Pour the remaining sauce over the enchiladas and sprinkle with cheese. Bake for about 30-35 minutes or until the cheese is melted and the sauce is bubbly. Remove from oven and allow to stand for about 5-10 minutes before serving. Makes 8 servings. I love your new spin on breakfast and you know what…my 2-year-old would really like this. She has such an adventurous food spirit, unlike me!! She’ll try anything. Just give me some crispy edges on top with the whole cheese deal and I’m a happy Enchilada eating momma. That a just one piece of chocolate for breakfast for good luck! So happy to hear another mother admit to the “fend for yourself” thing! These sound awesome, but my family isn’t a fan of cream of mushroom soup. Have you ever tried another vaiety? I do have a can of “Fiesta Nacho Cheese” soup that I haven’t been able to figure out how to use . . . .
I’ve only used canned cheese soup once and that was enough, haha! 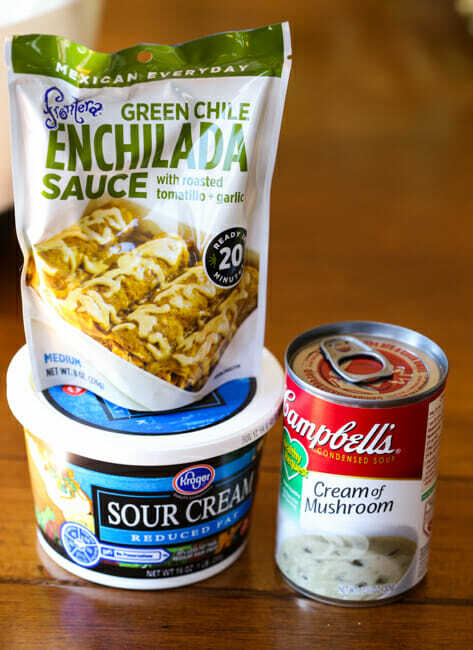 You need something that will stabilize the sour cream and canned soup is an easy fix, but you could make your own. Is it all cream of sometgibgb soups or just mushroom? Because you could do cream of anything. Ah – stabilizing the sour cream is the point – that made me think I could just make a white sauce and use that, but then I clicked through to your Cream of Chicken Soup recipe and that’s basically what that is. I think I’ll try that. It adds a step, but the family is okay with Cream of Chicken soup (and I think the chunks of chicken in the canned variety would be not very nice here). A wonderful breakfast idea. Excited to try the Rick Bayless sauce. Is there anything else to use in place of the cream of anything soups? Also can you make this overnight and cook in the morning? I am the mother of four and the grandmother of six. 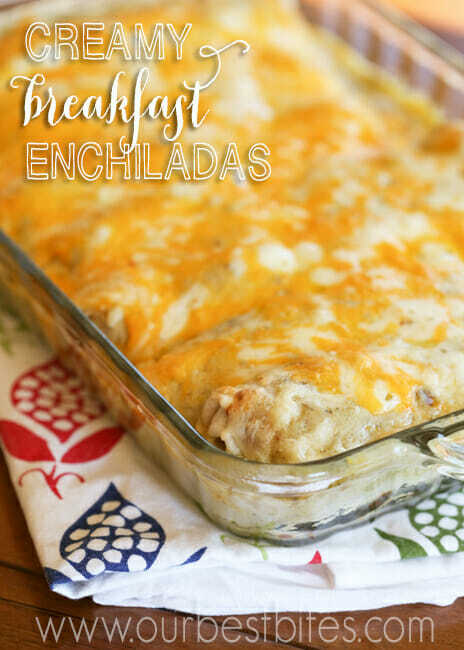 I made what was considered untraditional breakfasts for my children as well. I know that you mean well but I am astounded at how unhealthy most of the recipes posted on this blog are. It’s like a time warp, back to the fifties before people knew about additives, too much animal fat and so on. It’s a bit frightening! Hi, JoAnne–I’m not sure how frequently you read our blog, but we do frequently post healthy recipes made with fresh, seasonal ingredients. 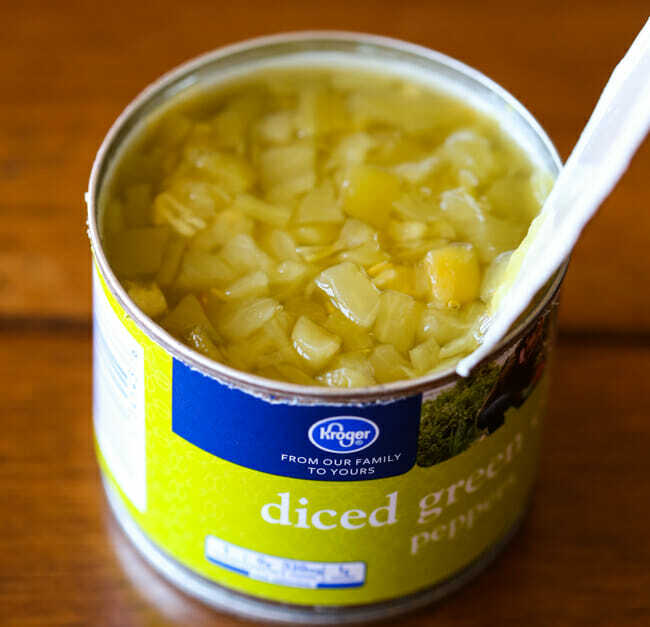 This is one of two or three that uses condensed soups. Hopefully you’ll check out our healthy section and you might find more of what you’re looking for. Have a great day! JoAnne, seriously how long have you been reading this blog??? I know! It’s like how many real meals can one be expected to make in one day?!! I love Mexican food for breakfast! So trying this on Saturday. Thanks for sharing! Any tips for storing left overs. It is just my husband and myself. But this will be a great dinner. Bought the red and green enchillada sauce from Amazon. So have plenty, plenty. Has anyone tried this with ground breakfast sausage? I have 8oz of turkey breakfast sausage to use up. Guessing I will need some hot sauce to kick up the heat if I’m not using chorizo. This sounds delicious~ Can this be made the night before and cooked in the morning? Could it be made ahead and frozen? 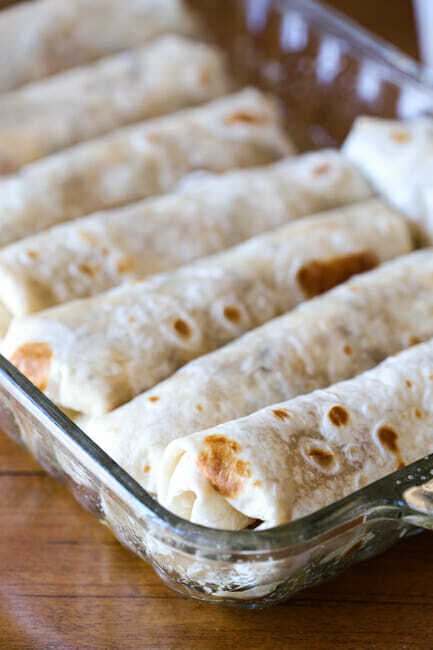 Did you use homemade tortillas? They look amazing! I can’t wait to try this recipe. I made this for dinner tonight–SO yummy! I used Monterey Jack instead of pepperjack (we’re a little wimpy when it comes to spice), and I used your cream of ____ soup recipe instead of using canned cream of mushroom soup. Thanks for the delicious recipe, we all loved it (even my 9-month old . . . she must have eaten half an enchilada on her own)! I would love to make this 🙂 Is there anything else to use in place of the cream of anything soups? Also can you make this overnight and cook in the morning? Planning to make this for a women’s breakfast at my church this Saturday… thinking I will assemble it all ahead of time and top it with the sauce and cheese that morning. Anyone tried making it ahead? All suggestions and feedback welcome!